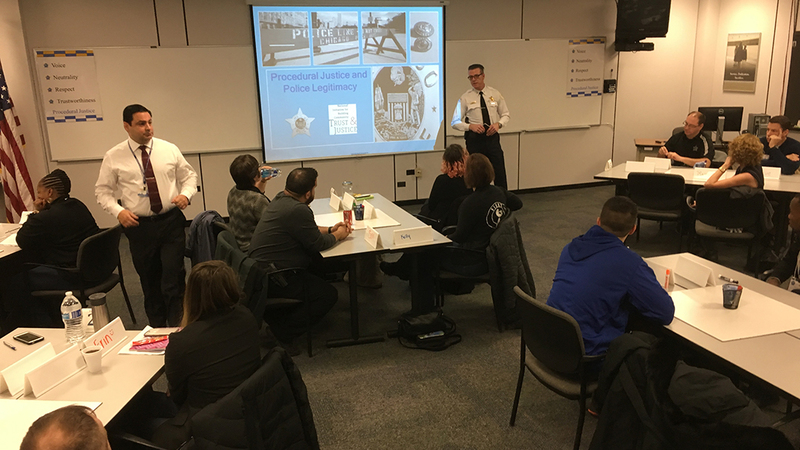 The Chicago Police Department is ramping up an effort to train its entire police force on how to better engage with the community. The training is called Procedural Justice and Police Legitimacy training. The name is a mouthful, but what it basically does is train officers to think a bit differently than what they’ve gotten used to in the line of duty. Chicago Tonight was allowed to spend the day in one of these training classes. It operates on four principles: giving the community a voice, maintaining neutrality in decision-making; respect with treatment to the community; and being trustworthy, something the Police Department has been struggling to gain over the last year or so. Some of it sounds like common sense, human-to-human interaction, but over the course of the day, the training went into each of those principles more in-depth. The 15 cops and the eight civilians in the room discussed the stress of everyday policing. Officers admit that they sometimes become so accustomed to only dealing with the 3 to 6 percent of the population who are actually committing crimes, they often apply their same aggressive behavior with the rest of the law-abiding population. “I think we need to be reminded that there are two sides to everything, and just … make us a little humble again,” said Officer Kelly McBride. “I love my job. … And even after 11 years they’re like, ‘Oh you start to get bitter, and you start to not enjoy it anymore, not want to help.’ But I still do. Some officers in the room spoke up more than others, and there was plenty of participation from the civilians. In the officers’ defense, one of the instructors pointed out to us, the Department of Justice report on the CPD was just released last week, Superintendent Eddie Johnson dropped in to offer a few words and stayed for the first hour or so, and there was a camera and a reporter in the room. With all that’s going on they may have been a bit hesitant to speak, though at times the civilians would challenge them, and they’d speak up. One officer explained why he didn’t want to share a story – good or bad – because he thinks all of his fellow officers do phenomenal work and they understand what he goes through, so he doesn’t want to boast about a victory any more than he wants to share a tough story. Tuesday’s training was an example of what they’re doing. There were more civilians in this class than have been in any classes previously, and the department is planning to include them more often, so that citizens can get a better sense of what officers are dealing with, and provide some input. They’re also creating more instructors so that they can add more classes, especially on Procedural Justice 2, it’s the more scenario-based training that builds on Tuesday’s class, which all officers who come in contact with the public are required to take. The third class is still in development: Procedural Justice 3 gets to the nitty-gritty discussion of implicit bias. We did manage to get a quick interview with Johnson on this issue. It was his first time attending one of these sessions, which started under his predecessor Garry McCarthy. Johnson says what’s important is getting this training into the hands of more officers. “It gives officers a sense of what the community looks at, and what they’re thinking. So that makes us become more of a partner with the community as opposed to just an enforcement arm,” Johnson said. The department says that so far, only about 4,000 officers and employees have participated in the second level training. They intend to roll out the implicit bias portion, likely later this year, after more folks have taken Procedural Justice 2. Jan. 17: Dean Angelo, president of the Chicago chapter of the Fraternal Order of Police, gives us his take on the U.S. Department of Justice report on the Chicago Police Department. Jan. 13: A majority of police officers say their jobs have become more difficult and dangerous in the wake of high-profile deaths of black citizens during police encounters, a new survey by the Pew Research Center reveals.